One of my favourite pieces of postpartum clothing!! These nursing tanks were practical and comfortable. With nursing babies in the winter, these tanks kept me from getting chilly when adjusting my clothing to feed. 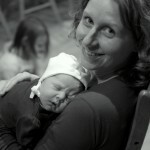 As an added bonus, my postpartum belly was kept under wraps. Pick your colour and size and we’ll ship directly to the winner! 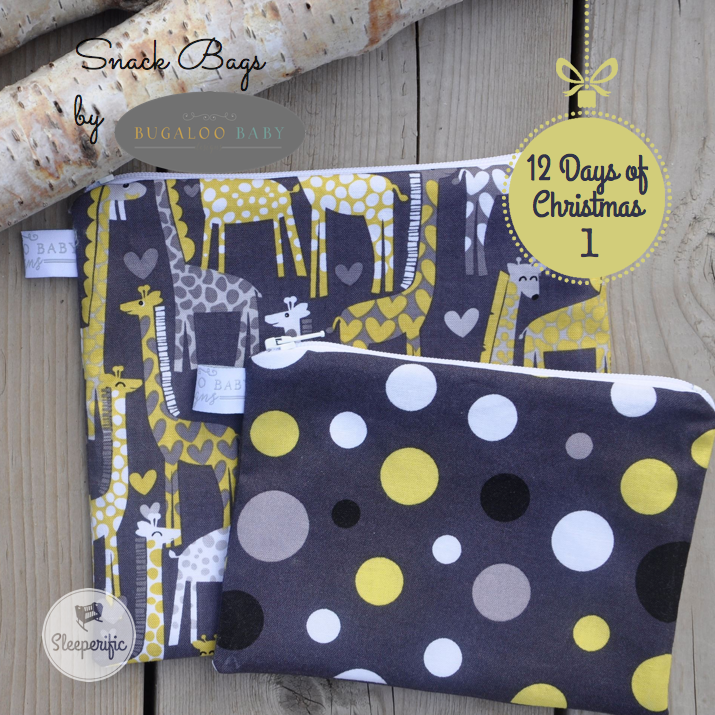 Missed our previous Days of Christmas Giveaway? This consultation is focused on building on a skill that’s already there. By the time mature sleep patterns roll around, you’ll have been practicing all the skills necessary to create a capable, independent sleeper. Visit Day 1, Day 2, Day 3, Day 4 and Day 5 to enter while you can! We have this wonderful print in our family room! Made right here in Canada by a lovely family. Sweet and sentimental, but still fits with the aesthetic of our home. We’ve received MANY compliments over the years. We want you to have one too. You can customize your family name and the colours to fit with your decor! 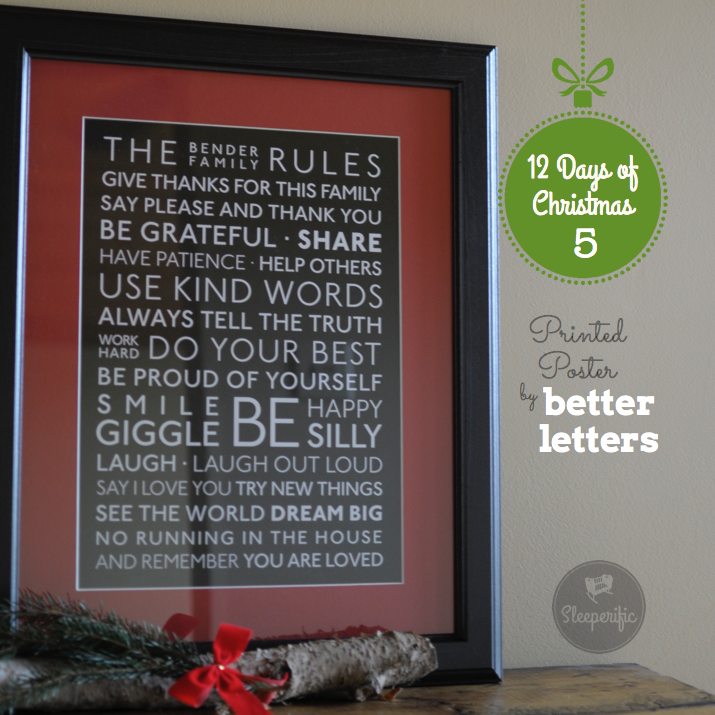 Check out better letters Art on Etsy for more fabulous products and designs. Visit Day 1, Day 2, Day 3 and Day 4 to enter while you can! 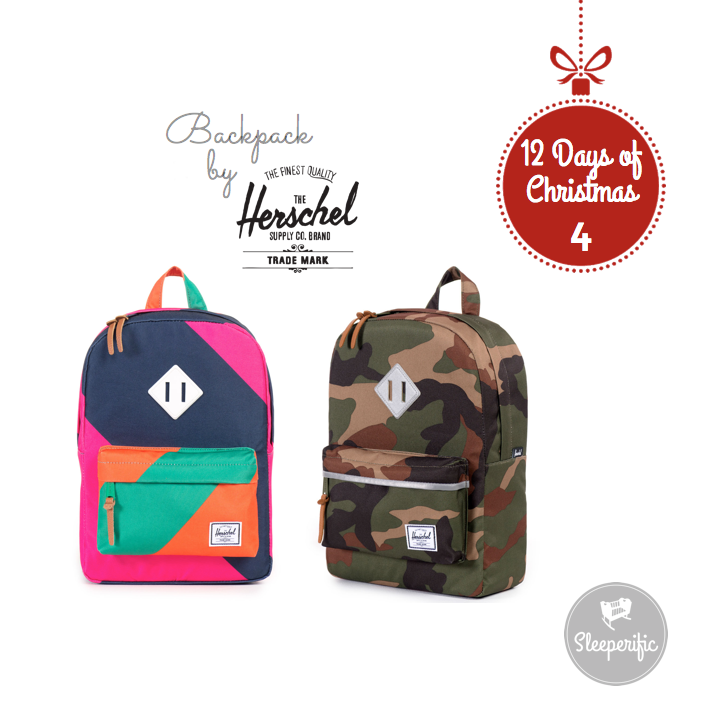 Maintaining the same look and feel as a classic Herschel, but sized for children 6 and under, the durable Heritage Kids pack is ideal for a visit to the playground. This bag is a perfect for a child heading to preschool or transitioning away from a diaper bag (as in they can carry their own stuff!). Easily accommodates a spare set of clothing, water bottle and snack! Visit Day 1, Day 2 and Day 3 to enter while you can! 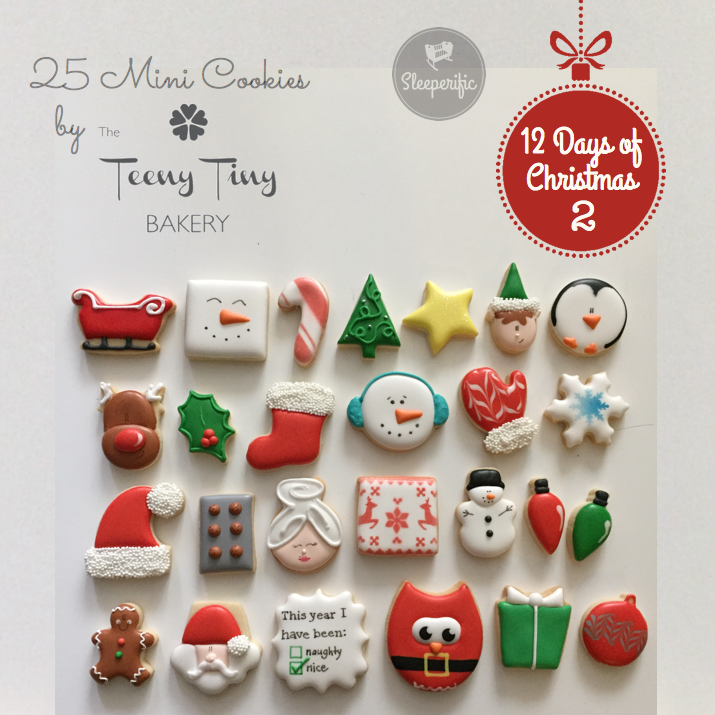 Each of these cookies is beautifully handmade and iced in The Teeny Tiny Bakery kitchen in Toronto, Ontario. 25 means you have enough for an advent calendar, if you can stop yourself from eating them all in one sitting. Jackie and her crew create beautiful custom cookies for every occasion. We’ve been lucky to enjoy many of Jackie’s creations over the years, and they’re always impeccable and always delicious. Visit Day 1 to enter while you can! We LOVE these bags. We use them for MANY on-the-go purposes: for snacks (obviously), storing small toys on road trips, or wet hand/face cloths when we head out to eat. They’re well made, right here in Canada by a work-at-home Mama. They come in a number of adorable prints pioglitazone 30 mg. They’re reusable. Wipe with a damp cloth or throw in the laundry. And the best part is that my toddler can independently open and close them! 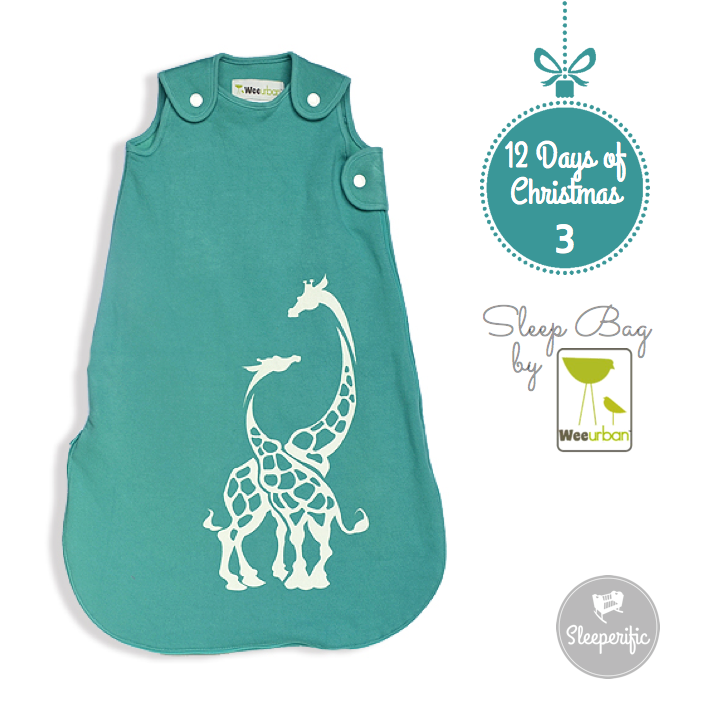 Check out Bugaboo Baby Designs on Etsy for more fabulous products and designs. Dropping naps is a major milestone for any family. The transition from 3 down to 2 naps is relatively easy to contend with. 2 down to 1 and 1 down to 0 – those transitions can be challenging for even the best of sleepers. I always encourage parents to protect those naps for as long as they can and transition only when absolutely necessary. If you’ve done everything to can to prolong their nap in a daily sleep schedule, you will have to an easier transition. Absolute readiness is key to success. The transition from 1 to no nap per day is likely to be between 3 and 4 years of age. 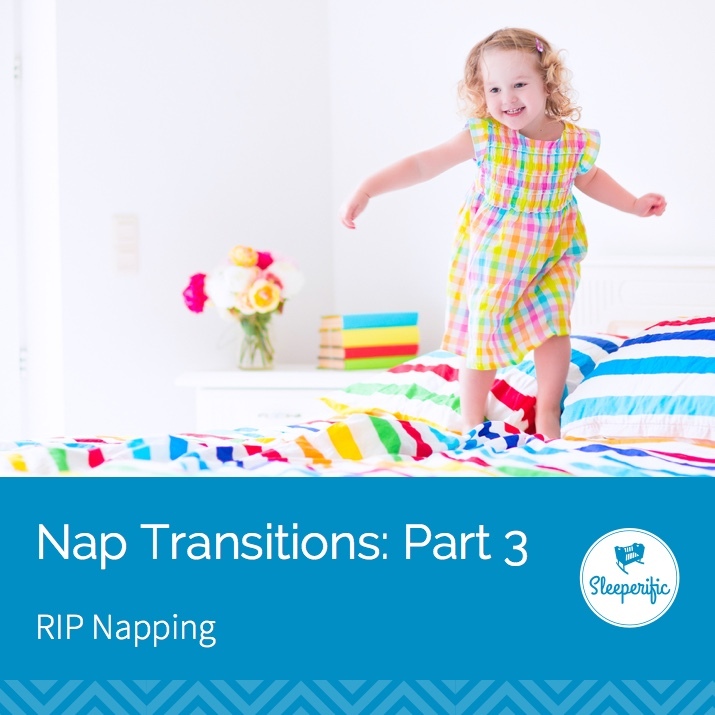 Although there’s lots of variation – some showing signs of readiness for transition as early as 2 years old, while others are willing to hold onto their second nap until closer to 5 years old. If your child generally seems well rested, is following a schedule that works for your family, I’m not concerned about the number of hours a child allocates to naps and night sleep. Simply getting an adequate quantity of sleep is most important. Ensuring physical activity, preferably outdoors. Each hour of inactivity delays bedtime by approximately 3 minutes! If your child is younger than 3 years, it may be worth trying to hold onto that nap. There are MANY significant cognitive leaps between their 2nd and 3rd birthdays. They might be inconsistent with day sleep, but continue to offer it. Many children under 3 will have some days where they may not nap, but that’s not a reason to take rest out of their daily schedule. It’s not unusual to have phases where naps are irregular. But keeping naps until at least age 3 has shown real benefits in areas of emotional control (hello meltdowns!) and problem solving. Bedtimes are likely to be reflective of your child’s particular sleep needs, along with their wake times. During a period of transition, you may find you need to keep bedtime cautiously early – just as their bodies adjust to bridging those long periods of wakefulness. I always recommend parents keep quiet time when transitioning away from naps. It gives your child the option to snooze if they need it, but as importantly, they have a chance to foster some independent playing skills, while giving their care provider a much needed break. Whenever there is a transition, the most important thing to remember is that the QUANTITY of sleep does not change dramatically. Just the ALLOCATION of the sleep is going to be adjusting. It’s very likely that a child who is adjusting to no midday snooze is going to need a very early bedtime to compensate for their missed sleep. 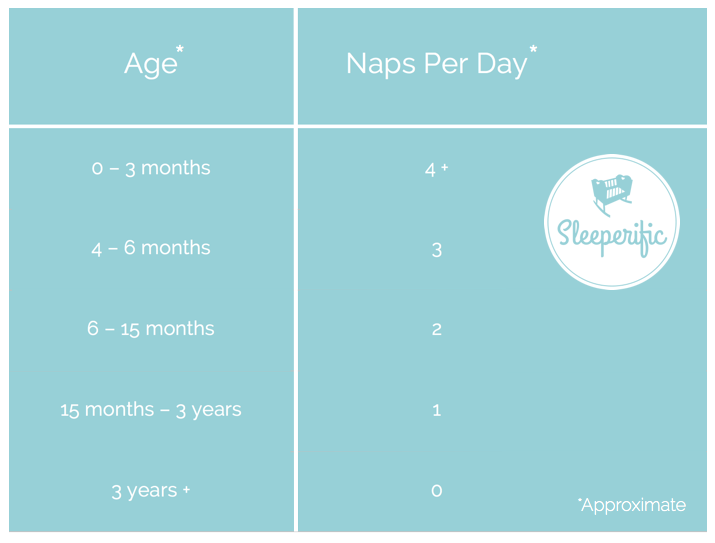 Here’s a handy little chart for approximating the quantity of naps for each age group. My baby is having trouble taking his 3rd nap in the late afternoon. When we’ve tried skipping it, bedtime is a mess. What should we do with this? When can we drop the nap? I’m often asked about these nap transitions. When to drop a nap from a schedule is a popular question for infants, toddlers and even preschoolers. This series of blog posts will discuss what signs to look for, approximate ages and some troubleshooting tips for either transitioning or trying to sustain an age appropriate schedule. Often infants will adopt a schedule of a morning nap, an early afternoon nap and a later afternoon catnap. While I’m willing to fight to keep nap 1 and 2, nap 3, meh. 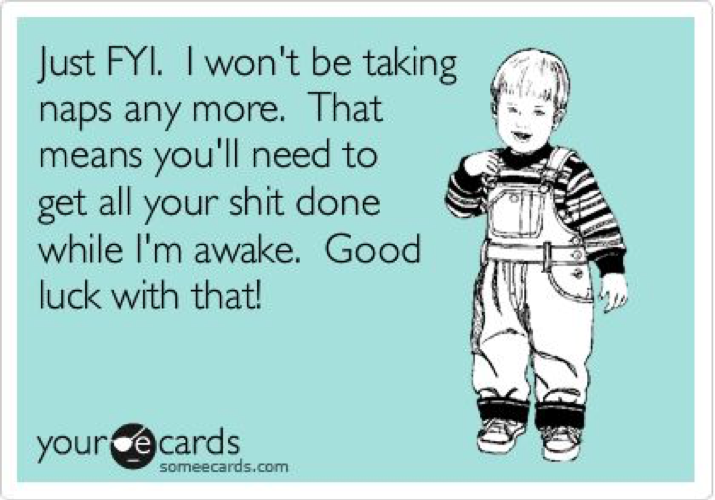 As soon as that third nap dwindles or becomes difficult, I find it’s best to say see ya later. What are some signs the nap is a problem? Generally, one of two things will start to happen. Your baby will either resist their nap (and stay awake, or maybe even protest through) their nap. Or your baby will love their last nap so much that it starts to interfere with an early bedtime. If this nap becomes too difficult, it’s not worth it. When is it age appropriate? Typically, a third nap can start to dwindle as early as 4 months (it’s early, but it’s not unheard of – this munchkin was the WORST third napper but had a pretty strong nap 1 and 2), but some babies are perfectly happy to keep a 3rd nap until 8 months old. Some families really like maintaining their 3 nap schedule because a parent doesn’t arrive home until later in the evening. It can be a great way to sustain a slightly later bedtime. This is the easiest nap to eliminate, especially if it’s 6 months or later. It’s likely you’ll nudge out nap 1 and 2 a little, spacing them out over the day. It’s also likely that your baby will need an earlier bedtime. 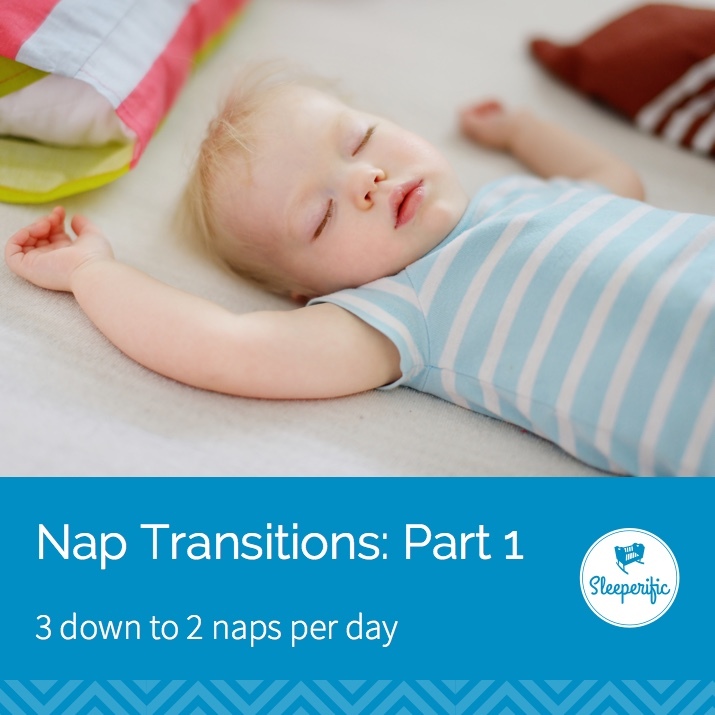 The most important detail to remember in any transition is that a child’s sleep needs DO NOT change, just because they’re transitioning to one less nap in the day. They can’t suddenly remove 30 minutes of sleep from their schedule. This transition is about a child being able to stay awake for longer periods. Sleep minutes that were typically part of nap 3 will need to be allocated somewhere else into the day (maybe other naps [see how to lengthen naps], but most likely, these reallocated minutes will end up in their night sleep). 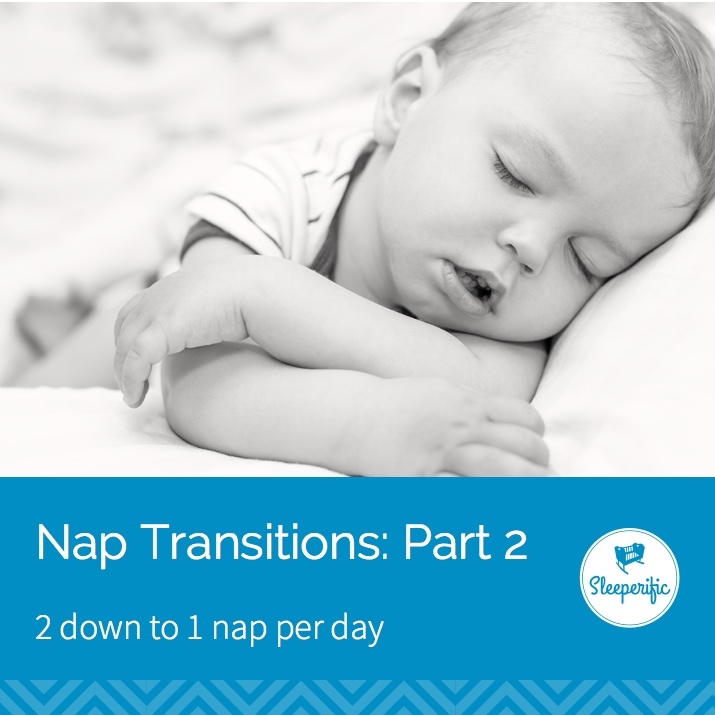 Stay tuned in coming weeks for the follow up posts on transitioning from 2 down to 1 nap and 1 down to no nap.